What are the Home Counties - And How Do You Find them? What Are the Home Counties? And Where on Earth Are They? What on earth are the Home Counties? If you've ever watched an English movie set in London and its suburbs, or read a book about the English middle classes, you've probably come across the phrase "the Home Counties." But what are they? And where are they? And they aren't the only English place names in common usage that are almost impossible to define or locate with any exactitude.. Ask two English people to explain what they mean when they talk about the Home Counties and you will get two different answers. The same is true of several other English regions that are full of attractions for visitors yet impossible to find on official maps. It's not that there's anything wrong with the maps - or that these places are imaginary - it's just that no one can really agree on the exact locations, borders and characteristics of these traditional places. This brief Cheats' Guide should help you find your way to the Home Counties as well as East Anglia and the West Country - two other real places not found on any maps. Here's everything you need to understand what they are, how they got their names and what to visit when you get to them. They all have attractions you won't want to miss. What Are The Home Counties And Why Should You Go There? The use of the phrase "Home Counties" to designate areas of England's southeast that surround London - but don't necessarily touch it - often baffles visitors. If pressed for an exact definition, most English people are puzzled as well. The Home Counties describe the counties that surround London but do not include London itself. Sometimes they are referred to as the London suburbs or the "stockbroker belt," but in fact, the designation covers areas much further from London than that. Generally speaking, the Home Counties are Berkshire, Buckinghamshire, Essex, Hertfordshire, Kent, Middlesex, Surrey and East and West Sussex. There's no official designation to these counties as a unified group. The description is more of a social and demographic way to identify the stomping grounds of the traditional English middle and upper classes. Sometimes parts of Cambridgeshire, Oxfordshire, Bedfordshire, Hampshire and even Dorset are included. Some parts of the Home Counties have, over time, been absorbed into London itself. The London Borough of Richmond, location of Richmond Park, Kew Gardens and Hampton Court Palace - was traditionally in Surrey but is part of London now. And even some people who live there, don't know that. Middlesex has virtually disappeared into London and parts of southwest Essex and northwest Kent have been absorbed into London as well. Why Are They Called The Home Counties? The land farmed around a manor house, where food for the population of the manor house and the estate was grown was traditionally called the home farm. By extension, the counties around London that supplied its large population with food and materials could have been called the home counties. Before efficient means of transportation and communications meant Members of Parliament could live almost anywhere, these counties were where MPs retired to between sessions of Parliament. Wealthy Londoners kept their country homes in these counties. Most City of London workers commuted from these counties. One definition that is sure to infuriate Brits from other parts of England is that being close to London they are at the heart of things and thus the "home" of England. The truth is, other than agreeing that they are the counties closest to London, most people cannot agree on much else about them. Bletchley Park, home of the code breakers, in Buckinghamshire. Warner Bros Studio Tour - The Making of Harry Potter - a chance to see the real studios where the boy wizard was filmed, the real sets and the real props, in Hertfordshire. 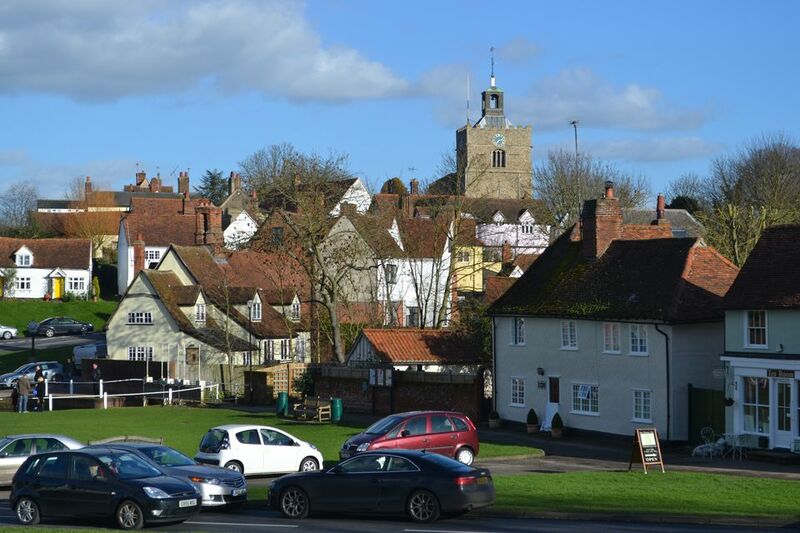 A Perfect Day Out and a Fine Pub Lunch in Finchingfield, often considered one of the prettiest towns in England, in rural Essex. Windsor Castle - How can you not visit the Queen's weekend home and the biggest inhabited house in the world, in Berkshire? Ightham Mote - a fortified, moated medieval manor in Kent, saved by an eccentric American and now owned by the National Trust. Legoland Windsor - with a hotel that has the most child pleasing, giant Lego sculptures you've even seen. Waddesdon Manor - a French chateau that could have been plucked from the Loire but was built as a Buckinghamshire party house for a Rothschild. What is East Anglia and Why Should You Go There? Ipswich claims the title of the oldest recorded Anglo-Saxon town. It is located close to the site of the Sutton Hoo discovery, an undisturbed 6th or 7th-century Anglo-Saxon ship burial of a king. Visitors from New England may be surprised at the familiarity of many of the churches, cottages and even some of the language used in East Anglia. That's because it was a hotbed of Puritanism and, in 1630 was departure point for the settlers of the Massachusetts Bay Colony who founded the Massachusetts towns of Salem, Essex, Lynn and Ipswich. John Winthrop, founder and first governor of the colony, was an East Anglian. Roger Williams, who founded Rhode Island on the principles of the separation of church and state, preached there. Look at a map of England and, on the east in the lower half of the country, you'll see a distinctive oval bulge, bounded on the south by the Thames Estuary, on the north by the wide bay known as The Wash and surrounded by the North Sea. That is East Anglia. It's composed of Norfolk in the north, Suffolk in the south and parts of Essex (also a Home County by the way) and Cambridgeshire in the west. Don't believe the guidebooks that tell you East Anglia is flat. While the north part of Norfolk has prairie-like arable fields, wide marshy fens and ancient, man-made lakes known as the Norfolk Broads, Suffolk is marked by gently rolling hills, small cosy dells and some of the most picturesque ancient villages in the UK. Several of the most beautiful North Sea beaches in England surround East Anglia as well. This region is also rich in medieval history with picture postcard villages, such as Lavenham and Kersey, that look virtually untouched in 500 years or more. Norwich - a university city with an unusual, 1,000-year-old cathedral and one of the best daily outdoor markets in England. Lavenham and the Wool Towns - villages where, except for the parked cars, time seems to have stopped in about 1400. In fact, some parts of the wonderful Swan at Lavenham date from even earlier. Undiscovered castles and a Cluniac priory - The sleepy town of Castle Acre, near Swaffham, has hidden riches. The spooky stalking grounds of the Witchfinder General in Manningtree and Mistley, Essex. While you're there, you can dine in style at the Mistley Thorn, the pub the evil Matthew Hopkins actually owned. Holkham Sands - a huge and extravagantly beautiful beach (it stood in for the new world in the last scene of Shakespeare in Love) with an official nudist area at one end. What is the West Country and Why Should You Go There? If you're fond of the 4 S's - Sunshine, Seafood, Surfing and Seashores - the part of the UK known as the West Country is where you will find all of those in abundance. It also has two amazing national parks each with its own breed of wild ponies and, depending upon how you define its borders, two of the UK's best cities for visitors and one of its most iconic ancient monuments. The West Country is the extreme southwest corner of the United Kingdom. A distinctive speech accent that still hangs on in the counties of Cornwall and Devon derives from the ancient Cornish language (now extinct except in folkloric revivals). more closely related to Breton, the original language of Brittany, than Anglo-Saxon and Norman influenced English. Purists will tell you that the true West Country consists of only Cornwall and Devon but nowadays much of the Southwest, including Dorset, Somerset and parts of Wiltshire are included. Because this is an unofficial geographic designation, it is something of a movable feast, particularly its Northeastern borders. If you are traveling in this region, you'll find the best surfing beaches on the north coast of Cornwall; the most gorgeous clotted cream teas and the prettiest thatched cottages in Devon; the fascinating Roman Baths in (where else?) Bath, which is also Jane Austen territory and great for shopping, and, if you stretch the borders to include Wiltshire, Stonehenge is just about on the borders of the West Country. The Eden Project - Paradise on earth, rainforests, deserts and the Mediterranean created in a former Cornish clay pit. Dartmoor National Park - 258 miles of lonely, beautiful moorland in Devon, and Exmoor National Park, moorlands and coast with wild ponies running free, on the borders of Devon and Somerset. Greenway, Agatha Christie's Summer Home - not only can you visit. You can even stay there. Honiton - Antique hunters' heaven in this Devon lacemaker's town. What is Treasure Trove and What Happens If You Find Buried Treasure?